To start the new year in an awesome way, we released APEX Office Print (AOP) 19.1 on January 11th. I typically don't blog about every new AOP release, but this is an important release in our history of the product. Our dream is that every developer can use AOP, that is why in AOP 18.1 (released September 2018) we made a Free Cloud Tier. With AOP 19.1 we go one step further... from now on you can run AOP in Developer Mode, which means you can call our cloud as much as you like in this mode. Your number of reports/credits in your plan are not touched at all. When you want to test AOP or are developing some new reports, you can use development mode so you don't need to use your credits for that. We had been thinking about this setting for some time, but Jon from JMJ Cloud reminded us how important it is for you in his nice blog post: APEX Office Print – Is it the APEX printing solution we have all been waiting for? Just like in previous versions we added a number of new features, fixed some bugs and made several enhancements. You can view the release notes for every version here. AOP 19.1 is again a free update for all our users, Cloud and On-Premises (with a valid maintenance contract). We love to listen to our customers and help them as good as we can to make their projects a success. That is why we like to release frequently, so creating the reports you want is easy, fast and integrated with Oracle APEX. In this post, I want to highlight some of the APEX Office Print (AOP) features that I believe make a difference, and why AOP became the go-to solution when you want to print and export your data in Oracle APEX. If you want to see AOP in action, definitely check out the AOP Sample App. Just like BI Publisher or XSL-FO, AOP has a server component. The difference is that AOP is one executable, has a built-in web server which can autoscale depending the number of CPU cores and it listens on incoming requests with a JSON payload. 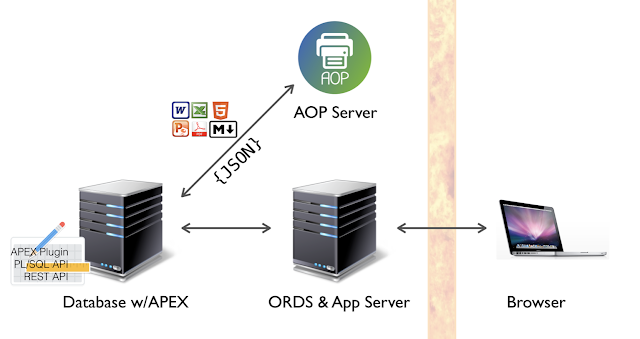 The AOP Server is very simple to install, upgrade and maintain, yet flexible and scalable out-of-the-box. To make it really easy to do calls to the AOP Server, we built a PL/SQL API on top of the REST interface. As we love Oracle APEX so much, we built an APEX Plug-in on top of the PL/SQL API. Our idea is that you are up-and-running in less than 5 minutes. 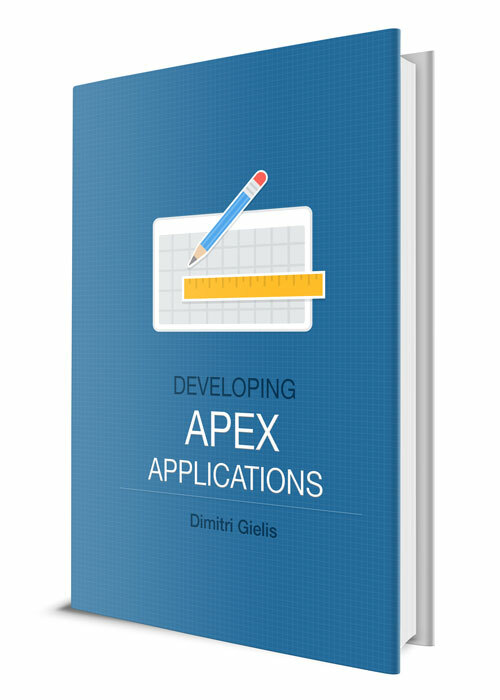 AOP is the most integrated solution for APEX apps on the market. We went much further than the built-in BI Publisher and XSL-FO support. AOP understands your Classic Reports, Interactive Reports, and Grids, Charts and Calendars. AOP lets you print or export your Interactive Report and Grid exactly as you see it on the screen, with highlights, computations, breaks, group by etc. In the APEX Plug-in you specify the static id of the region(s) and AOP will do the rest. The APEX Plug-in is really flexible and the easiest way to get your reports done in no time. You specify your template, the data source(s) and your output, that's it. AOP is template driven, you basically create a template in your favorite editor. AOP supports templates in Word, Excel, Powerpoint, PDF, HTML, Markdown, Text and CSV. In the template, you use specific tags AOP understands. You find an overview of tags in the AOP documentation. As many people generate PDF documents, since AOP 18 we are focussing to include more and more PDF-specific features. 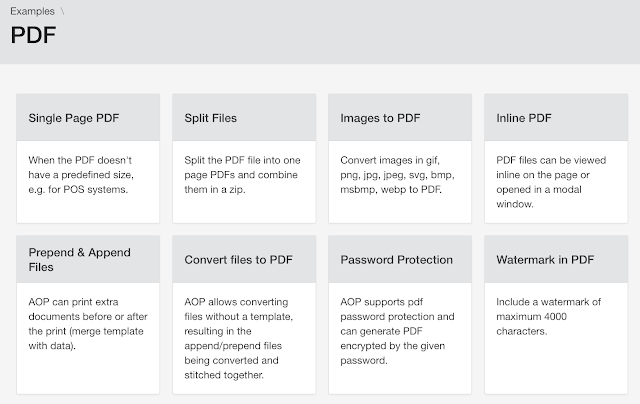 AOP allows you to generate PDFs from almost any file format, even images, you can merge PDFs, split them, password protect the PDF and you can even include a watermark. We also have a special PDF, called Single Page PDF. Some people don't know the size of the document, so they just want a PDF with a variable size. For example when you get a receipt in a restaurant, depending on the number of dishes and drinks the PDF is different in size. We are developers ourselves and have been using AOP since 2015. Sometimes you don't know what's going on, so from day one we heavily instrumented AOP to see exactly what it's doing and give you all the tools to make debugging fun. The Web Editor allows you to create documents really fast, look at debug info, see the different requests and try different options really fast. We love our customers and find support extremely important as we want you to be successful. You can contact us through our support email or through the new AOP Slack Channel on apex.world. The above is just a small set of features I believe make a huge difference compared to any other engine. You don't have to take my word for it, just give AOP a try with our free version and development mode and decide yourself :) And know you are not alone, we are proud of every single customer we have from large customers like Siemens, NASA and even Oracle, to smaller customers like Storm-Petrel (who use AOP extensively! ).